Multiple file-format choices exist, but you might want to consider taking additional steps when saving your parts for 3D printing. One can choose from a number of file formats for 3D printing, and in general they all work fine. However, understanding what mesh resolution is needed for each part can affect the size of the file, which may create lag when transferring data. In addition, not everything transfers smoothly from a CAD drawing to the printer. This article will look at file resolution, clearance between moving parts, geometric interferences, and more things to keep in mind when moving your CAD drawing to a 3D printer. I remember when I was planning my first 3D printer purchase. These were endless hours of browsing phrases like “3D printer choice criteria” or “the most important 3D printer details/parts”.Almost every article’s main point was “it depends on what do you want your 3D printer to be used for”.And this is obviously true. Of course, I know that this is not what you are looking for, so in this article I would like to introduce you to a list of the seven most-important features of 3D printers which you need to look at before buying a new one of your own. This is usually the first parameter given by 3D printer manufacturers. It determines the maximum size your printed element can be. It involves three numbers. The first two are the length and width of your printing, and the third is height. So, at the beginning you should think about the biggest thing that you might want to 3D print with your device, and reject all the 3D printers whose build volume is too small. You should also pay attention to the units used. Some manufacturers use inches, others use millimetres or inches, so be careful. OEM Renishaw has collaborated with software company Identify3D to produce an end-to-end, secure digital manufacturing process. The collaboration between Renishaw and Identify3D will deliver secure manufacturing to supply chains in the aerospace, automotive, defence and medical sectors, as these industries make the leap to 3D printing. The issue of protecting intellectual property (IP) has faced almost all industries that use 3D printing, from design to manufacturing. It has formed the basis of questions that 3D Printing Industry has put to experts across the field, with many agreeing that additive manufacturing does not readily fit into existing IP protection structures. For the last 20 years, manufacturers have used 3D printing to build prototypes, but it was only recently that this industrial technology entered the mainstream. The 3D printing of products can enable faster time-to-market, save money, mitigate risk and allow manufacturers to customize a component to suit customer needs. 3D printing can produce individual, specifically tailored parts on demand. Boeing printed an entire plane cabin in 2013 and Ford can manufacture vehicle parts in four days that would have taken four months using traditional methods. After realizing the boost 3D printing could deliver to manufacturing, the U.S. government increased funding for institutions researching AM technologies. In 2012 the federally funded National Additive Manufacturing Innovation Institute (NAMII) was launched — a $30 million pilot institute aimed at boosting 3D printing’s use in manufacturing. Also referred to as America Makes, the institute works with brilliant minds from industry, academia, and government. It is expected that these collaborations will help reduce the period of development between a lab’s proof-of-concept and commercial product. With the U.S. government investing more in AM and 3D printing techniques, governmental organizations are now starting to integrate the technology into their own processes. Emirates has for the first time used cutting-edge 3D printing technology to manufacture components for its aircraft cabins. The airline used Selective Laser Sintering (SLS), a new 3D printing technique to produce video monitor shrouds. The airline has also 3D printed, received certification for and installed aircraft cabin air vent grills for on-board trials in its first class cabins. 3D bio-printing: A medical revolution? As medicine advances, technology is playing an ever-increasing role. The development of CT and MRI scanners to see inside patients, pacemakers to keep hearts beating, and prosthetic limbs that interact with the nervous system, have proved how valuable technology can be for our health. Has technology got our backs again, this time with an organ transplant crisis? There is a severe need for new organs for transplantation around the world. In the last decade, nearly 49,000 people have had to wait for a life-saving organ transplant, in the UK alone. Of those, over 6,000 people have died whilst waiting – all possibly preventable if organs had been available. The issue is, with an ageing population and a safer environment, there are fewer organs available for transplant, and more organ failures requiring a transplant. The vast majority of the demand is for kidneys, with over 5,400 on the current UK waiting list. Author Supercharg3dPosted on 13th November 2017 21st November 2017 Categories Industrial Uses, Paradigm Shift, TechnologyTags Healthcare, MedicalLeave a comment on 3D bio-printing: A medical revolution? The ability to 3D print more than one material at the same time and thereby create complete items with no assembly is a transformational capability. Congratulations to the University of Nottingham team! A team of researchers based at the University of Nottingham’s Centre for Additive Manufacturing have demonstrated a method for efficiently 3D-printing fully functional circuits containing different materials. Printing electronic components allows for the rapid manufacture of flexible, low-cost devices. These printed devices typically use just one material, meaning that the printed components can only perform limited functions. 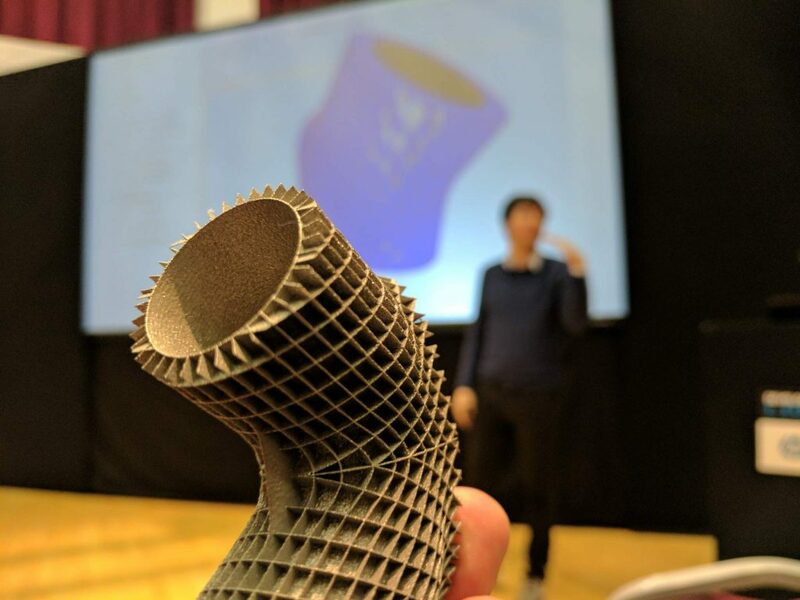 Multifunctional additive manufacturing, however, involves printing multiple materials from a single 3D printer to create more complex components with a range of functions. Printing electronic devices containing different materials (metallic inks to form conductors and polymeric inks to form insulators) requires a range of heat sources such as ovens or hot plates to solidify each material. This renders the process highly inefficient, particularly when hundreds of layers are required to form a component. One of the original purposes of Supercharg3d is to bring pragmatism and balance to what is all-too-often a hyped technology (not that it isn’t disruptive and already changing supply chains!). This is a good summary of some of the key issues preventing it’s wider adoption. You know when a product comes out and we think it’s awesome? Then years later, something comes out to replace it, and we look back at the first thing like, “What a pile.” Well, I’m almost to that point vis-à-vis 3D printers, even though there’s nothing to replace them. You’re probably groaning by now, but hear me out. Yes, prices for the maker/desktop/DIY category of machines have dropped, the quality of their output has increased, and promotional materials abound with printers creating beautiful and delicate objets d’art. But like the movie montage where the kids clean up the house before their parents get home, they are glossing over the details. What isn’t shown is the effort, the sweat, the tinkering, the trial and error, and the screaming to the gods themselves to please, please let it work this time. Patients could benefit from printed body parts in just five to 10 years, according to Reza Sadeghi, chief strategy officer at Biovia group of technology company Dassault Systemes. Bioprinting first generated media buzz several years ago, when researchers showed videos of ears grown in a lab and 3D-printed skin. Since then, the bioprinting sector has been developing at light speed, thanks to computer models, lab experiments and animal trials. The major progress today is the successful development of biomaterials that can actually be used for bioprinting, Sadeghi told PE at the Manufacturing in the Age of Experience conference currently underway in Shanghai, China. He also predicted that human trials are now less than half a decade away. 3D printing technology offers countless opportunities to transform the manufacturing industry. 3D printers have expanded a company’s operational capabilities to encompass the use of rapid prototyping. These new developments include 3D printing pumps. Manufacturing pump components can be a costly process, making 3D printing the perfect solution for companies to take advantage of. Materials used for 3D printing pumps can range from polylactic acid to stainless steel, presenting enormous opportunities for companies who adopt the technology in order to improve their bottom line. 3D printing pump components has become particularly beneficial for those who produce complex castings for many pumps including centrifugal pumps, water and sewage pumps, turbine pumps, transfer pumps, fluid flow pumps and many more. Increasing fabrication speed and efficiency while maintaining accuracy and precision are present challenges for manufacturers, and have spurred innovation within the industry to lower costs and deliver a better product to customers. Companies who are putting the power of 3D printing to the test may be eligible to take federal and state Research and Development Tax Credits.